Chromatic passing notes – Instant Bebop guitar lesson! In this guitar lesson I am going to demonstrate and explain three ways you can use to add chromatic passing notes in your guitar solos. Using chromaticism in this way is a great way to add some bebop or jazz flavour to your solos even if you don’t really play that style of guitar. In the first line I am adding chromatic passing notes between two scale notes. This happens in bar 1 between the D and C and in bar 2 between the A and the G. You should notice that the line is still heavily based on the arpeggio. This is because besides from the passing notes it is very important to play form the chords when playing bebop and jazz styles. In the line I am only using passing notes between adjacent scale notes in a descending melody, but the same is of course possible when ascending. If we take the concept and turn it into an exercise you could end up with this exercise. The core of the exercise is a C major triad in the 8th position. There is ascending and descending chromatic approach to each note. When you want to add a passing note between two scale notes a half step apart it gets tricky. This happens when moving from F to E (bar 3) above. My fix for this is an idea I have from Barry Harris: When there is no chromatic note possible we borrow the diatonic note above. In this case that’s a G. This pretty much always works. A very common way to use chromatic notes is to encircle a chord tone with a mix of a diatonic and chromatic passing notes. In the line below I do this in the first bar. First the G that is suspended by an A and an F#, and then the Bb which is encircled by the A and the C. Of course A is doubling as a chromatic and diatonic passing note. Turning this idea into an exercise is fairly easy. In example 6 I use this diatonic above chromatic below through a C7 arpeggio. For demonstration purposes I kept it short by starting on the 5th. 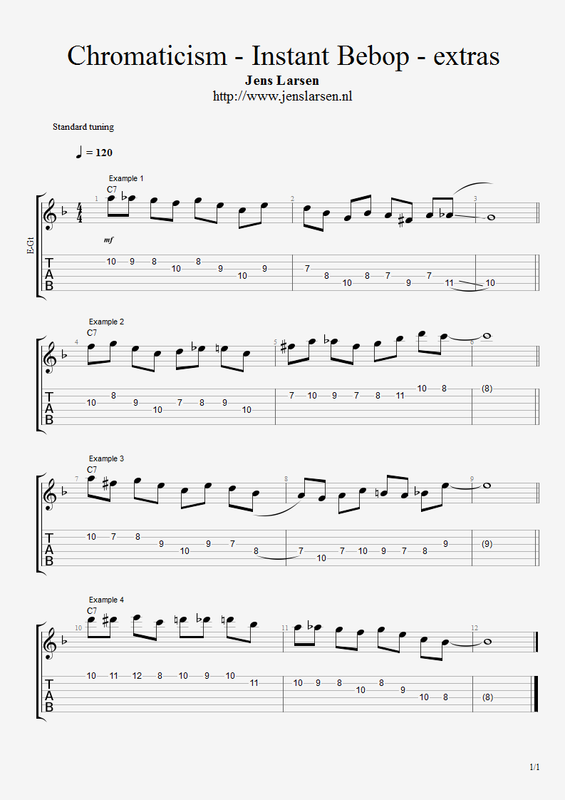 To get these ideas into your own solo lines you need to first mess around with the exercises and get them into your ears and fingers. Once you can play them without too much trouble you can start working on composing simple lines mixing up arpeggios and chromatic ideas. To get you started I made two such simple line in example 7. The first line is a C7 apeggio preceded by an enclosure of the C and ending with a descending chromatic passage down to the root. The second example starts off with two enclosures of the 5th and 3rd before it moves from the root to the b7 via an chromatic passing note. Now that we have two basic ways of inserting chromatic notes we can start combining these to make a long chromatic suspension of a chord tone. In the line in example 8 I am using an idea like this by combining the two previous ideas. The target note it s the Bb on beat three and it is preceded by an encircling and a descending chromatic leading note. The way I play this is based more on keeping the whole phrase on one string that trying to stay in position. This works better for me most of the time, but is of course not the only way to do it, so you might want to experiment a bit. I hope you can use these ideas to get started improvising with chromatic passing notes in your lines and find some new melodies that fits your taste and playing. This entry was posted in Blog, Lesson and tagged approach notes, chromatic, chromaticism, enclosures, leading notes, passing notes on January 5, 2017 by jens.